This tart is amazing. 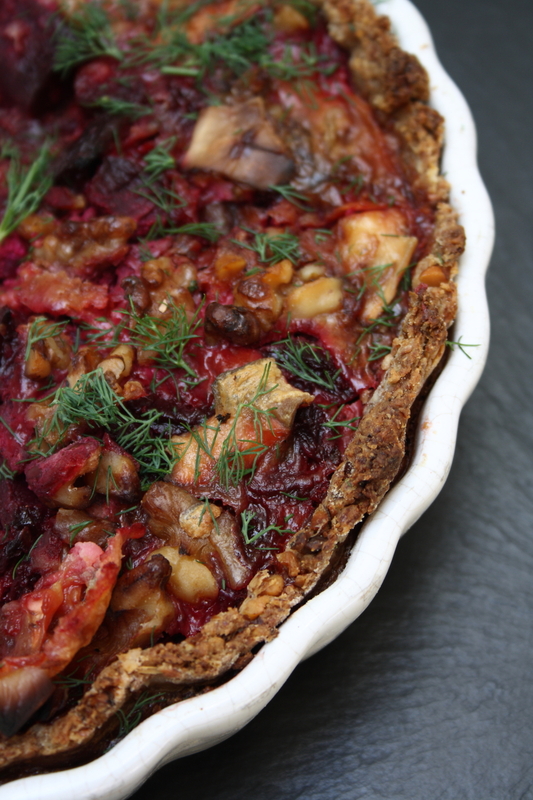 Seriously gorgeous, and it’s vegan and gluten-free. It tastes like Millionaires Shortbread with nuts in. 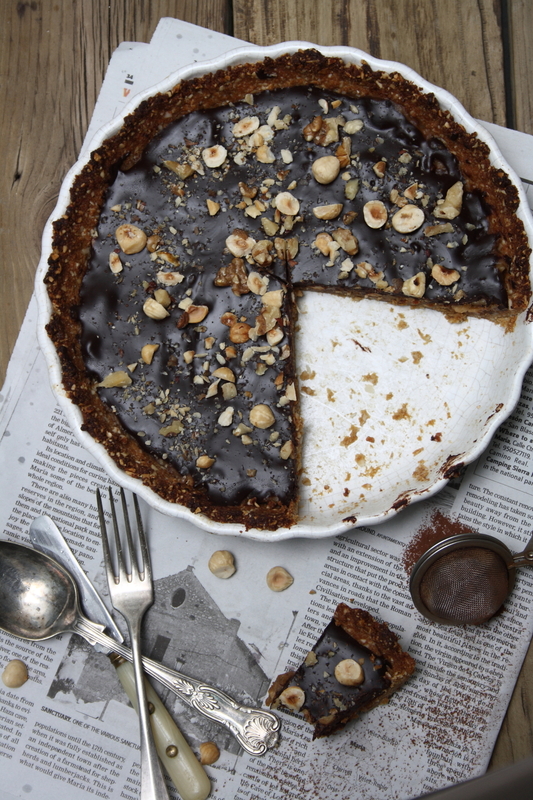 There is a crumbly nutty crust made with ground almonds and coconut oil then a layer of date caramel (new favourite thing) filled with toasted hazelnuts. 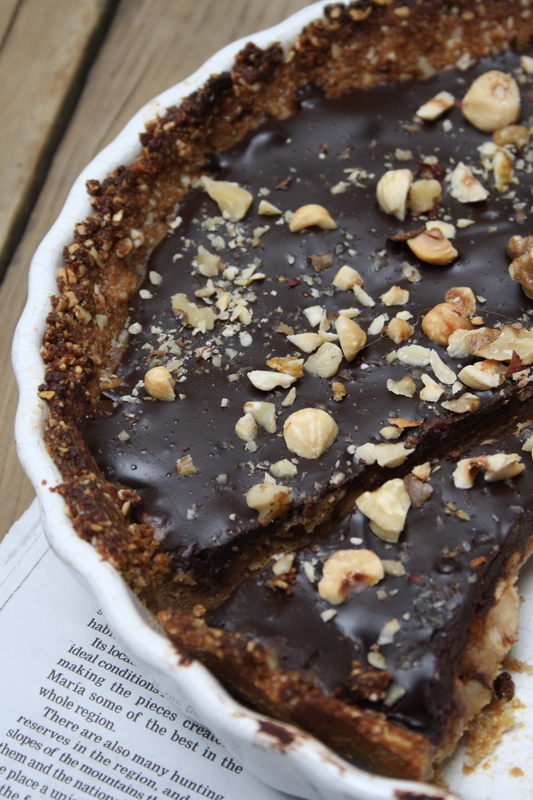 Then it is finished off with a layer of dark and delicious chocolate ganache and a sprinkling of chopped nuts. 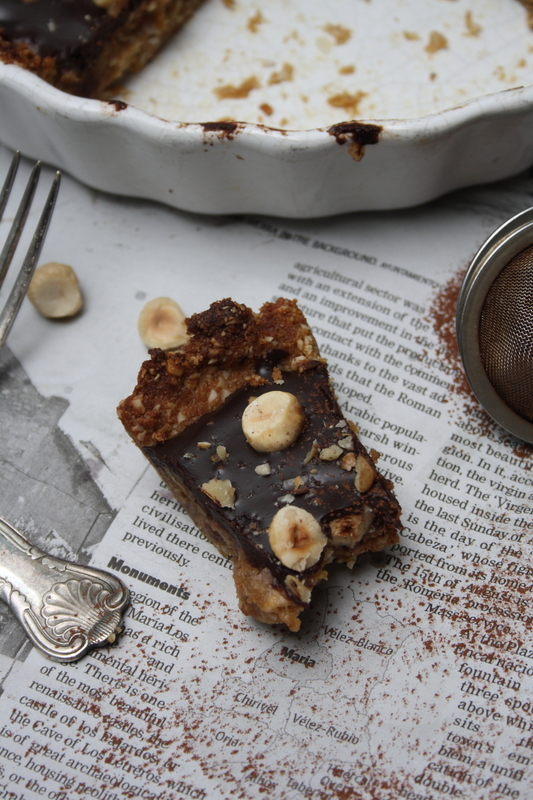 It’s chewy, sweet, crunchy and crumbly at the same time and it has no butter no refined sugar and no flour. Do you love me? Be warned though, it is very addictive and quite rich. Like that could be a bad thing. 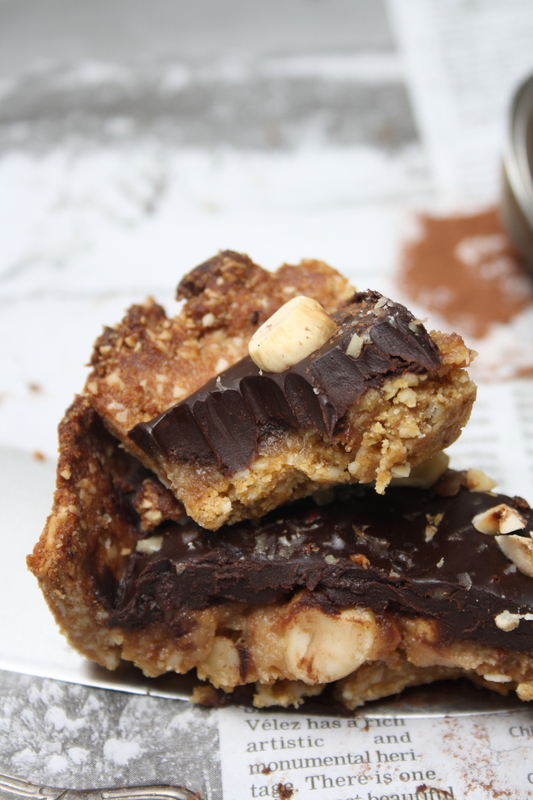 You have to make it just to let your friends and family know how delicious vegan desserts can be. No one would guess and they will all want the recipe. 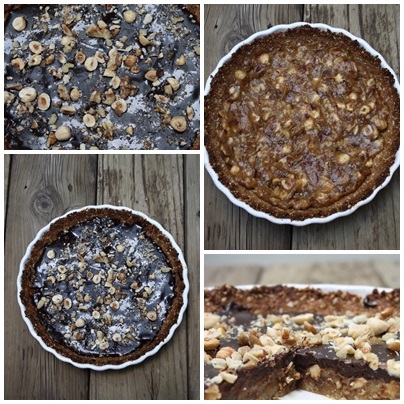 This is one of the recipes from my Healthy Baking with Chocolate Workshop, the next one of which is on Saturday 2nd March from 5pm – 9pm at the Pepe Kitchen Cookery School in Benalmadena, Malaga. At this workshop I will be demonstrating how to use olive oil and coconut oil instead of butter in baking as well as showing how to use wholemeal spelt flour and ground almonds instead of bleached white flour. We will also be using honey, maple syrup, molasses and dates instead of sugar for natural sweetness and oat milk replaces cow’s milk and cream. The chocolate we use is either 70% cocoa solids dark chocolate or pure cocoa powder. Oil a 9 inch tart tin, loose bottomed if possible. Put the ground almonds & salt in a bowl, add the maple syrup/miel de cana and melted coconut oil and use a fork to blend it together until it is well combined and resembles crumble mix, a few minutes. Tip this into the tart tin and press it out all over the base and up the sides firmly & evenly with your fingers. Prick all over the base with a fork. Put in the fridge for a t least 20 minutes. Then preheat the oven to 175 C and bake for 15-18 minutes until golden but not too dark. Leave to cool while you make the filling. Remove the stones and blend the soaked dates with the soaking liquid, melted coconut oil, salt & vanilla until smooth, thick and creamy. Stir through 3/4 of the chopped hazelnuts and then pour/scrape the mixture into the cooled tart case. Spread it out evenly with a spatula. Put in the fridge to set while you make the chocolate layer. Blend the maple syrup/miel de cana and melted coconut oil together until well combined. Add the cocoa/cacao powder and blend again, scraping down the sides if necessary, until smooth. 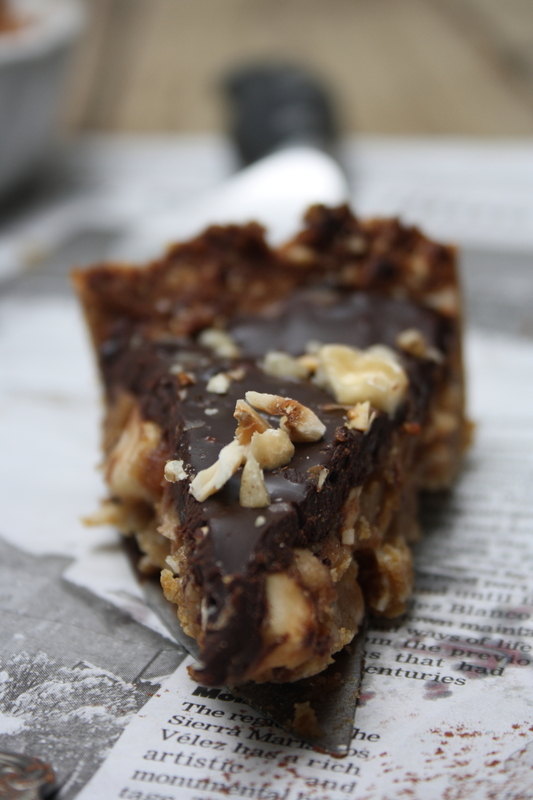 Pour this over the date caramel hazelnut layer and spread out evenly with a spatula. Sprinkle over a little sea salt and the remaining chopped hazelnuts. Put back in the fridge for at least an hour before serving. I thought you might like to see a little YouTube video of my Healthy Baking Workshop (savoury & sweet) that took place on Sunday morning. The next one is on Saturday 23rd March 10-2pm. Just click on the link below…..